Barangay Telabastagan, headed by its chairman Elmer Manguerra, bested 10 other participating villages in the showdown of lights and colors Saturday, December 15, at the Robinsons Starmills. The village’s long-time head lantern maker Arnel Flores, accompanied by rotor maker Arnold Flores and head electrician Allan Tongol, crafted this year’s 20-feet winning entry which is powered by a total of 10,000 colorful bulbs and nine well-designed rotors. Flores said their entry’s trademark “half-half play” — an interplay of half white, half myriad of colors dancing to remix music and later to the live accompaniment of Lumanog brass band — became their ace in winning the championship. “It has been a trademark of our lantern for a long time now, and we have been developing it over the years to become ready for this winning moment,” Flores said. 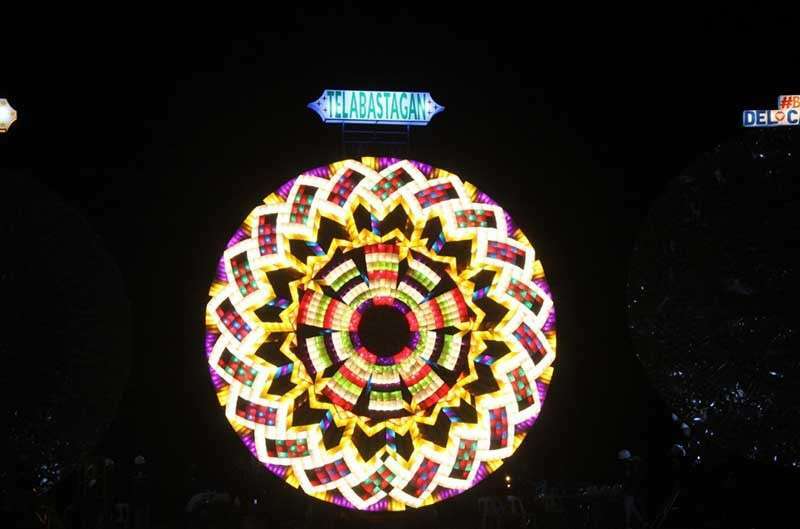 Aside from its trademark play, Barangay Telabastagan’s lantern also featured the green-colored “peace” word to promote harmony and unity this holiday season, he added. 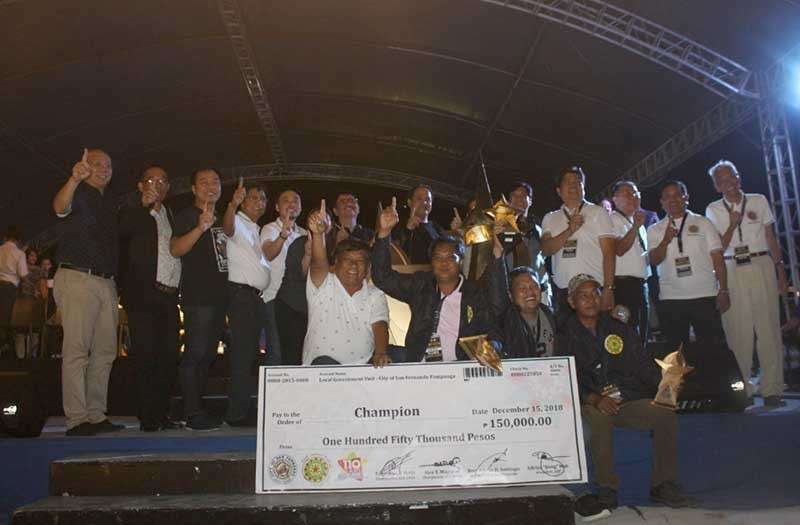 The Barangay Telabastagan lantern-making crew took home P150, 000 cash prize, trophy designed by distinguished artist Toym Imao, and a whole year of bragging rights. Emerging as third runner-up is Barangay San Nicolas handled by head lantern maker Edmar David, rotor maker Edwin David Jr., and head electrician Jay-R Abaracoso. The two Davids are part of the third generation lantern makers in the village. Barangay San Juan’s lantern crafted by the youngest lantern maker for this year’s GLF Mark Niño Flores, and rotor maker Christopher Dizon and head electrician Alberto Dungca won as second runner-up. Barangay San Jose, who made a history for featuring the first lady lantern-maker Maryanne Torres, was hailed as the first runner-up for this year’s competition. Accompanying Torres was Ronald Ambrocio in the rotor-making, and Marcelino Ambrocio as head electrician. GLF 2018 chairperson Alex Patio credited to the heart-felt artistry of Fernandino lantern-makers the success of the annual Ligligan Parul which has withstood several man-made and natural disasters and still awe hundreds of spectators at its 110th year. 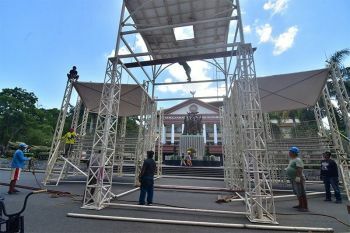 He stressed that City of San Fernando continues to uphold its title as the only Christmas Capital of the Philippines and Home of the Giant Lanterns due to the common and innate love of its people in preserving its culture and heritage. “This innate artistic character of our local craftsmen is the reason why we are, and will remain the giant lantern capital of the Philippines. Many people can imitate how we build this lanterns, but they can never steal the heart that comes and is put in every creation,” Patio said. Patio also branded the giant lantern makers as “investors of the culture”, saying their showcasing of talents have led to the preservation of the giant lantern-making industry for over a century now. “Our giant lantern makers are our investors of culture. Their names are mostly forgotten, and their works did not reap for their financial returns, but through their participation in the 110 years in the giant lantern making, they were carried on to make sure their legacy lives on,” Patio said.